Start your trip to Sudan | Travel Expressions Ltd.
Sudan is a country in northeastern Africa. It is bordered by Egypt to the north, the Red Sea, Eritrea, and Ethiopia to the east, South Sudan to the south, the Central African Republic to the southwest, Chad to the west and Libya to the northwest. 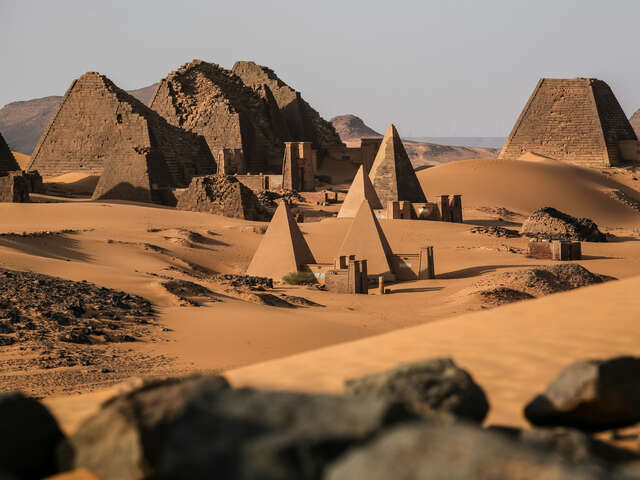 The third largest country in Africa, Sudan was home to numerous ancient civilizations, such as the Kingdom of Kush, Kerma, Nobatia, Alodia, Makuria, Meroë and others, most of which flourished along the Nile. During the pre-dynastic period Nubia and Nagadan Upper Egypt were identical, simultaneously evolved systems of pharaonic kingship by 3300 BC. Its capital is Khartoum, the political, cultural and commercial centre of the nation. It is a presidential representative democratic federal republic. The politics of Sudan is regulated by a parliamentary organization called the National Assembly. The Sudanese legal system is based on Islamic law. Ride a Camel, and See the Historical Pyramids in Sudan With pyramids as stunning as those found in Egypt, Sudan also offers the same travel attractions but on a less touristy scale.